Bullseye powered by Handshake will provide you with a highly personalized list of job and internship recommendations based on your interests, major and skills that are found in your profile. Explore collections of jobs just for you. Complete your profile by adding your work experiences, skills, interests and organizations to it to attract top employers and land your next job or internship. Plus+ Students with a full profile are 5x as likely to be messaged by employers. Favorite jobs to prioritize applications and never miss a deadline. Download the app and keep up with the latest opportunities! Schedule appointments, interviews and join events or career fairs on Bullseye powered by Handshake. Check out student and alumni reviews of employers across industries, companies and roles and learn from their experiences. Download the Handshake Jobs & Careers app! > Download the Handshake Jobs and Careers app now in the app store or Google play. Login to your account today to complete your profile, upload your resume, search and apply for jobs or internships online, view upcoming events & career fairs, schedule career counseling appointments and use other online resources. More than 200,000 employers are looking to hire you. Show off your best self and get started today when you make your profile public! Logging In to Bullseye powered by Handshake? Good News! Students and alumni already have a live student/alumni account in Bullseye powered by Handshake. Just login with your UBIT name and password. Have questions about how to use Bullseye powered by Handshake? Here are some video tutorials to start. 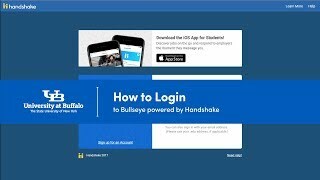 This video will help you login to Bullseye powered by Handshake. 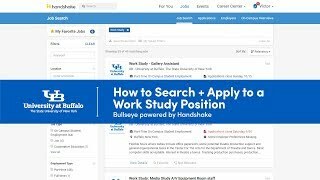 This video will help you search for work study jobs on campus. This article will help you schedule a career counseling appointment. Fake Job Scams. Learn more on how to recognize and avoid common online scams designed to steal money or your identity. >Visit the UB Information Technology Fake Job Scams page.